Find the perfect teacher or instructor in University for private trumpet lessons in your home or in their studio. With over 12 years of experience I help you take your trumpet skills to the next level. Whether you are a beginner or intermediate player I can help with breath support, range, repertoire, and much more. My son Callum says he's 100% certain he's going to get better at trumpet by working with Tom. I have prepared many students for tryout pieces (solo, regionals, chair placement, etc). I also am experienced in tone improvement, endurance studies, range extension, and accuracy improvement. I use many different method books, but I prefer Arbans and Clarks. Trumpet lessons with Arias are always tailored to the individual student and that student's needs in order to facilitate maximum growth as a trumpet player and musician. Arias believes in an individualized approach, meeting the student where he/she is and moving forward through the developmental process, beginning with a strong base of fundamentals and an ever-present focus on musicality, expression, and exploration as an artist. 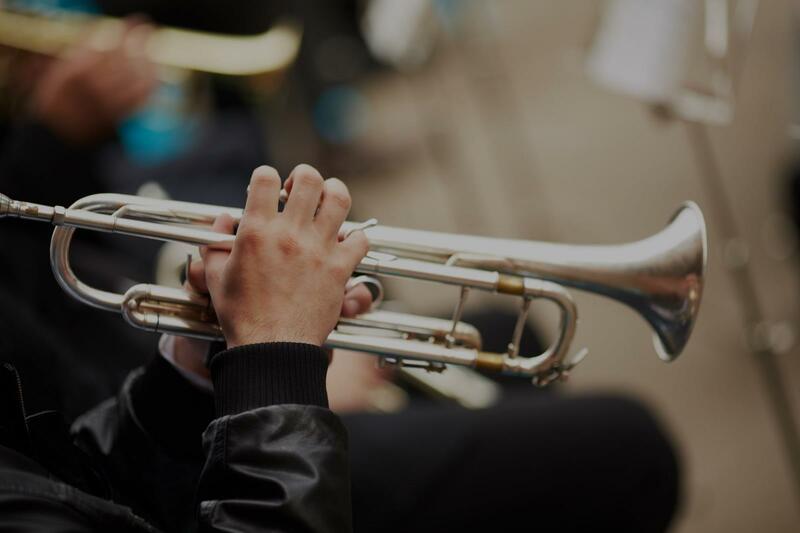 Arias works to foster a positive learning environment where the student can learn and develop a positive self-image and confidence, while working to create a strong base of fundamentals and good playing habits to then transfer to musical settings. Hi, there! My name is Doug and I can't wait to meet you! I've been teaching private lessons since 2007 and have loved helping my students learn their chosen instrument! Many of my former students have gone on to become composers, performers, and active instructors. I went to UW-Milwaukee and earned a degree in Music (Trumpet and Piano Emphasis) in 2009. I'm a fun and enthusiastic instructor and my teaching style reflect this. I look forward to helping you reach your goals! s for a variety of musicals, and more! experience. We look forward to learning and growing with Thomas as our instructor." Denver, CO teacher: Tom G.
"Made lesson to my level (beginner) but geared to adult intetest"
r me to appreciate each and every bar rather than focusing on finishing a song. As a student who has become well-adjusted to structure, I learned the beauty of improvisation informed by theory through Tom. He is attentive, passionate, and always makes sure I got the concept he's teaching. He has a rare gift of creating such an intimate, peaceful environment where I can feel at ease and really thrive in playing music. It was in these calm moments my passion for jazz sparked more and more. I'm truly thankful to have had Tom as my mentor/teacher. -JL, student at NYU. May 2012"
"Tom has been a very knowledgeable and patient instructor for my son. We appreciate him." "My teenage son was skeptical about taking private trumpet lessons. But to my surprise he seem to be enjoying them so far. I think Tom is a great teacher. According to my son, he is a very good listener and provides good feedback on what he needs to improve on. It is definitely worth an hour drive each way." "My son Callum says he's 100% certain he's going to get better at trumpet by working with Tom." ic and listening to popular trumpet players." "Very patient and methodical in his approach for our beginner"
"William has great energy and works very well with our 10 year old."